A BETTER YOU. A BETTER LIFE. Yourself By Simply Changing Your Mindset? Are you capable of great things? Most definitely, but only if you avoid a certain mindset. Studies show that if you focus on excuses, justifications, jealousy, resentment and other negative emotions, your odds for success in about any endeavor are greatly reduced. It is because when you focus on negative ideas, negativity appears in your life. The opposite is also true. If you focus on positive feelings and develop a mindset that constantly thinks about what you “can-do” rather than what you “cannot do”, you “can” create just about any reality. Before you start making excuses and justifying why you have not realized all you want out of life, consider these stories. Being African-American when Wilma Rudolph grew up was tough enough. She wore leg braces until she was 9 years old because of her infantile paralysis. Scarlet fever, whooping cough, measles and other health problems plagued her regularly. Yet with all these physical and cultural issues virtually guaranteeing she would never amount to anything, she became a gold medal athlete three times over in the 1960 Olympics. She earned the title as the fastest woman on earth and went on to challenge and empower black women in the US and around the world. You may have heard of Colonel Sanders, the founder of Kentucky Fried Chicken. He dropped out of school at 13, quit or was fired from more than a dozen jobs, his wife deserted him and he retired as a self-proclaimed “loser” at the age of 65. He viewed himself, some would say rightly so, as a massive failure. He lived off of Social Security and his meager savings. Then one day he made a decision. Nothing more than that. He simply made a choice in his mind. He knew he was a good cook. He borrowed some money and began going door-to-door selling his tasty fried chicken. He kept working and eventually created the global KFC fast-food chicken empire. He reached billionaire status at 88. Abraham Lincoln was fired from several jobs and failed at business numerous times. He was demoted in the Army. He lost elections for different government positions 8 times. Lincoln still went on to become the 16th President of the US, arguably one of the greatest presidents in the history of the United States. What is one important thing these and so many other incredibly successful people have in common? They created, nurtured and never abandoned a strongly held belief. They abandoned unhealthy mindsets of negativity and failure and decided to be successful instead. If you believe that, you are adopting an excuse mindset. You are cuddling up next to the justification mindset. These and other negative mindsets are unhealthy. Neurologists and spiritualists have proven that chronic negativity not only keeps you from getting what you want out of life, but it also leads to physical and mental health problems. If Wilma Rudolph, Harlan Sanders or Abraham Lincoln had decided to accept what life had dealt them up to a certain point, we never would have heard of any of these amazing people. Odds are you probably haven’t encountered as many hurdles in life as the three people we just talked about. you know you can be, living the life of your dreams. You can do that when you use proven methods for abandoning unhealthy mindsets and self-beliefs, and instead embrace mindsets that move you unerringly and relentlessly towards achieving any goal. This in-depth mini-course on proper mindset development will help you change the way you think so you look at your life goals and the challenges you will inevitably face with a positive and proactive outlook. That your mindset reflects your priorities. Prioritize according to your most important dreams and goals and you can create your perfect reality. 23 unhealthy and self-defeating mindsets and how to avoid them. How a sense of entitlement weakens you. When you move from a fixed mindset to a growth mindset, anything is possible. How to overcome low self-worth and appreciate how amazing you are. Why you must avoid the “once ‘this’ happens I will be happy and fulfilled” excuse. That jealousy and resentment stifle and hamper the achievement of your goals. How to stop comparing yourself to others, a mindset practice which limits what you can achieve and who you can become. What you focus on most of the time drives your behavior, and your behavior in turn molds your existence. How to stop seeing nothing but obstacles and start recognizing opportunities instead. The physically and mentally debilitating effects of negative thinking. How to stop blaming others for your situation and start accepting responsibility. How to beat mindsets of greed, anger, procrastination, excuse making and playing the victim. The positive, healthy mindsets you can embrace to change your life … starting right now. Former underachievers become successful in a number of endeavors and walks of life seemingly overnight … once they kick negativity to the curb and embrace a positive, proactive mindset. That is exactly what Conquering Unhealthy Mindsets can help you do. It shows you how to remove limiting mental blocks and self-beliefs which have kept you from realizing your dreams and desires. Download your copy of this potentially life-changing special report and within minutes you can begin changing your reality from stress, frustration and failure and towards peace, fulfillment and success in any aspect of your life. It’s up to you to act! Start now and begin to enjoy the awakening and personal transformation that leads to the best possible you. Detailed Information That You Can Use Starting Today! DO NOT NEGLECT THIS CRITICAL INFORMATION A DAY LONGER! Are You Focused So Much On The Future That You’re Missing The Now? Are You Still Shaped by Your Past? Do You Believe You Are Incapable? 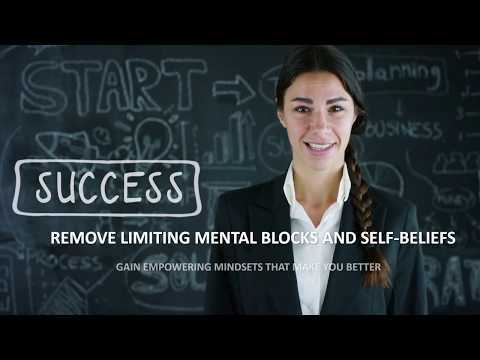 Is Your Mindset Blocking You From All That You Want To Achieve?